Refugee week came with many events in the UK and the world at large. 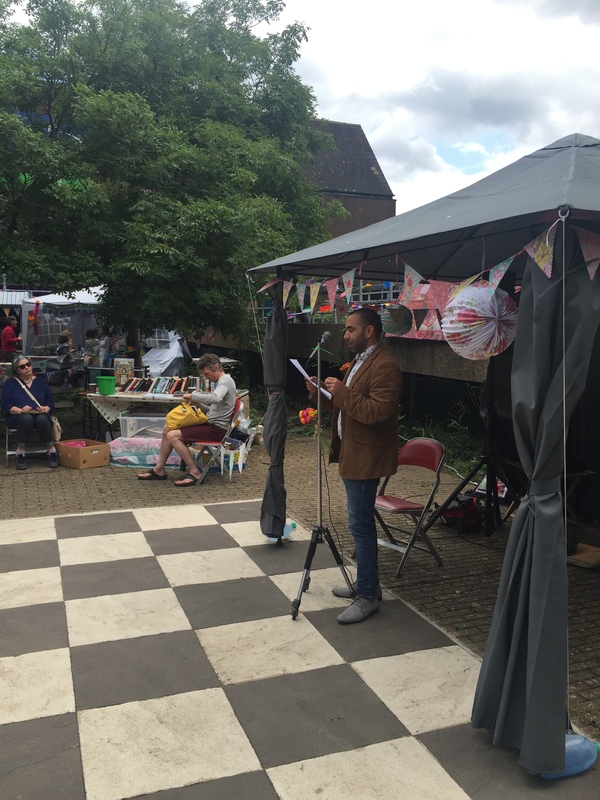 As British Syrian poet of Kurdish origin and an immigrant myself, the week was special. My participation in Refugee week was unique. It started on 22/06 at the Free Word centre who commissioned me to write a poem for the occasion. Islington refugee centre collaborated with the Free Word centre during that event. Together they brought a collection of immigrants from different backgrounds. All preformed art pieces where some did it with music. Another collaboration was the live streaming of the event with other refugee week events across Europe. My second participation was on the 26/06 in the open air at Tonbridge, Kent. As we got off the train awaiting Tariq to collect us, we were greeted by another participant (Zahra) who arrived with her Oud to play. Locals gathered there with several organisations that held stalls to promote their causes. As the third participation was close in time to the second (26/06), we arrived to the location (Refugees Welcome Haringey) late. Everyone was finished, events stopped and people were about to leave. Nonetheless, the organisers agreed to hear out my poems and gathered whoever left for the reading. The last contribution was in Twickenham, Richmond on 30/06,and particularly at the premises of St Mary’s university. The event collected around 200 people who came to celebrate the week. What was different at the event that contributors were mostly Syrians, where their voices were clearly heard. All my participations were in association with Hikayetna project, who met and arranged such occasions. The project continues to thrive with pure humanitarian aims in mind and away from politics. Overall, the week was one to remember with all these events, collaborations and wide participations. It will be useful to see such attentiveness to refugee theme throughout the year and not just during that week.